Priva Shave ® Post Shave Treatment “FoR WoMaN™” has been carefully developed to ensure maximum Post Shave comfort for clients having a hair removal procedure performed on their bikini lines, legs, under arms, fore arms, eye brow as well as their upper lip. 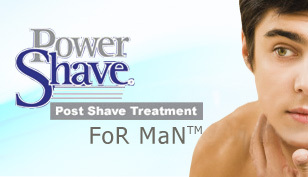 Power Shave® Post Shave Treatment “FoR MaN™” Unique anti-inflammatory agent(s), And it’s antiseptic agents together prevents the introduction of skin surface as well as air borne germs into the pores and opened skin abrasions due to the shaving process. Prevent bumps, ingrown hairs and razor burns. Helps to reduce swelling and soreness, skin. Prevents discoloration and itching resulting from hair removal.